Confession time. I am a book hoarder. I love how books smell. I love feeling their pages. I mostly love the piles of books I see on our shelves, on the floor, or wherever I can fit them around the house. I saw a meme in a book loves facebook group I’m in that said it’s not called book hoarding. It’s building a home library and a lightbulb went off. I’m building a home library. If you read any dystopian books, there is usually a common thread among them. That thread is that there is no reading, whether they don’t write that part in at all or it is specific to the story. Reading brings ideas, and people can’t be controlled when they have their own ideas. Now I don’t think we are in any way heading in that direction……yet. But as it seems the quality of the books coming out has started going down and the accessibility of quality books is going down as well, it might be time to start saving them. 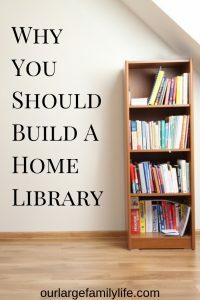 Why You Should Build A Home Library. Quality literature is set apart from a lot of what is published today. There are a lot of books my kids ask to bring home from the library which I just can’t do. Sorry, I’m not doing Captain Underpants. If you hear the same books being praised over and over it’s for good reason. Likewise the longer a book has been around also telling you something. Today’s culture is all about distraction and pleasure. We live in a quick, we want it now society, that is teaching us to constantly lose our ability to focus and appreciate better things. Making sure our children have access to quality books, will help to counteract these influences. They will be able to develop better language skills and learn vocabulary. What they read influences how the will communicate as well. Quality literature allows kids to develop their imaginations more. Instead of pictures or drawings every couple of pages, they are left to creating the pictures that the books describe in their mind. Quality literature will have truth, goodness, and beauty in it that will start to shape our kid’s souls and character. Instead of emulating children in stories that are snotty or obnoxious, they will hear of characters who are brave, heroic and stand up for justice. I think this is just as true for children as it is for adults. Adding these books to your home library allows you to know they will find good stuff no matter what book they are reading. Building a home library gives your children access to books. They don’t have the barrier of waiting for a trip to the library. They can look and read on their own agenda instead of ours. It gives them room to discover different books on their own. Having the ability to browse books on different topics means they can find new things. It also means no matter where you live you will have good books with you. Small town libraries may not have the selection you like, or there just isn’t time to go to the library often. Books at home mean reading can happen no matter what the current living situation is. It’s been said that you can tell what is important to a person by taking a look at their checkbook. Seeing what people will trade their money for shows what they value. Buying books show that books are important. It also gives you the opportunity to read as well. We can’t tell our kids how important reading is but never be will to buy or read them ourselves. Setting the example ourselves is what is most likely to have an impact on our children. Stocking up on good books means there is something for mom to read as well. Although most good books are enjoyable to children and adults alike. I am finding more and more that libraries are definitely limited when it comes to good literature. I actually find myself surprised when they have something I want. If you want good books available to your kids, the best way to make sure that happens is to supply them with the books. Having them on hand vs. having to hope the library carries it and it’s not checked out is definitely the better option. It also means they will be there when your kids need them for school. Instead of having to put it on hold, it’s ready when you need it. You also keep it which means you don’t have to worry about returning it or late fees. If you know a book will be needed longer than the checkout period and by multiple children. it makes sense to buy it. Buying the book means it’s there and ready when you need it and doesn’t disrupt your school schedule. There is something about a good story that speaks to your soul. The books make their way in and become part of who you are. The stories and characters stay with you. This is something only that happens with the best stories. In a world where kids seem to be fighting a losing war against distractions, literature that speaks into your soul is a great way to bring them back. It shapes us. Everyone has different tastes when it comes to food, movies, and even books. Building a home library means you will have lots of books in different genres to appeal to all the different persons in your house. Building a home library that has books on many different subjects and across genres means everyone in your house has the opportunity to find what they love to read about. You might be asking how buying more books for your home can save money. Two Words. Maybe I’m the only one who is paying library fines, but those can add up. Especially when you can get books so cheap from library sales or thrift stores. It seems like if you know it’s something your family is going to love then just go ahead and buy. Lost and damaged books are another reason. If you lose your own books, it doesn’t matter much unless you need it for school. If it gets damaged you can go by another used copy for super cheap rather than have to purchase a new one for the library. 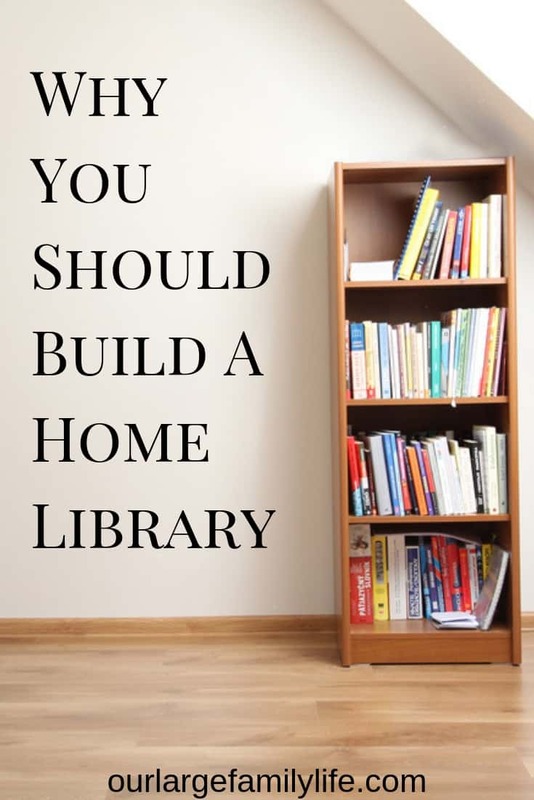 Building a home library is definitely an investment. You invest your time, your money and space in your house to make a home library happen. When you think about the doors it can open for your kids, the possibility it gives them, it’s kinda no brainer. Giving them access and availability to good books can be life-changing and soul-shaping. 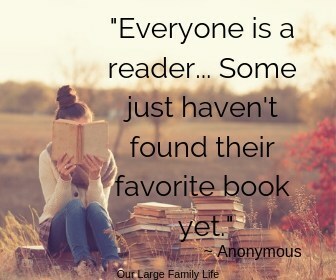 It’s worth the time and money to find books that everyone will enjoy. It is a hobby for the whole family. What are you adding to your home library?